Over-the-counter (OTC) is the trading of securitiesMarketable SecuritiesMarketable securities are unrestricted short-term financial instruments that are issued either for equity securities or for debt securities of a publicly listed company. The issuing company creates these instruments for the express purpose of raising funds to further finance business activities and expansion. between two counter-parties executed outside of formal exchanges and without the supervision of an exchangeStock MarketThe stock market refers to public markets that exist for issuing, buying and selling stocks that trade on a stock exchange or over-the-counter. Stocks, also known as equities, represent fractional ownership in a company. OTC trading is done in over-the-counter markets (a decentralized place with no physical location) through dealer networks. Contrary to trading on formal exchanges, over-the-counter trading does not require the trading of only well-standardized items (e.g., clearly defined range of quantity and quality of products). Also, prices are not always be published to the public. However, OTC contracts are bilateral, and each party could face credit riskCredit RiskCredit risk involves managing the creditworthiness of all entities a firm lends to, including bondholders. Credit risk is the risk of loss that may occur from the failure of any party to abide by the terms and conditions of any financial contract, principally the failure to make required payments on loans concerns regarding its counterparty. OTC securities comprise a wide range of financial instruments and commodities. Financial instruments traded over-the-counter include stockStockWhat is a stock? An individual who owns stock in a company is called a shareholder and is eligible to claim part of the company’s residual assets and earnings (should the company ever be dissolved). 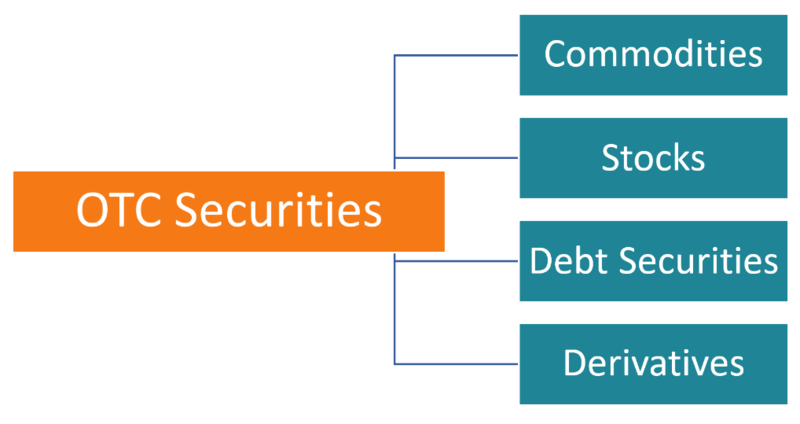 The terms "stock", "shares", and "equity" are used interchangeably., debt securities, and derivatives. Stocks that are traded over-the-counter usually belong to small companies that lack resources to be listed on formal exchanges. However, sometimes even big companies trade their stocks over-the-counter. In the United States, over-the-counter trading of stocks is carried out through the networks of market makers. The two well-known networks are managed by OTC Markets Group and Financial Industry Regulation Authority (FINRA). These networks provide the quotation services to participating market dealers. The trades are executed by dealers online or via telephone. While over-the-counter markets remain an essential element of global finance, OTC derivatives feature an exceptional significance. The fewer number of limitations and regulation provides greater flexibility to market participants, which can adjust derivative contracts to better suit their risk exposure. Also, OTC trading increases overall liquidity in financial markets, as companies that cannot trade on the formal exchanges gain access to capital through over-the-counter markets. However, OTC trading is exposed to numerous risks. One of the most significant is a counterparty risk – a probability of other party’s default before the expiration of a contract. Moreover, the lack of transparency and weaker liquidity relative to the formal exchanges can trigger disastrous events during a financial crisis. The flexibility of derivative contracts design can worsen the situation. The more complicated design of the securities makes it harder to determine their fair value. Thus, the risk of speculations and unexpected events can hurt the stability of the markets. For example, notorious CDOs and synthetic CDOs that caused a significant impact on the global financial crisis in 2007-2008 were traded only in the OTC markets. Restricted Trading ListRestricted Trading ListSecurities are placed on a bank's restricted list when the bank is engaged with the company on non-public activity, such as mergers and acquisitions work, affiliate ownership, or underwriting activities or other distribution of the issuer's (the company's) securities.